After researching Inspirion to fully understand their vision and audience, we developed a streamlined website with updated functionality. The new site allows users to access client portals, upload files, and review their portfolios in real time. And, with a mobile-friendly design, it offers an enhanced user experience. By building the site with a content management system, we’ve ensured that future updates to the site can be made with relative ease. We then created a set of marketing materials to reinforce their new brand, support the site, and help individual advisors build personal relationships with their clients. These materials included a business letterhead, a 2-pocket folder, inserts detailing individual services, business cards, an updated logo, and a client portal information card. 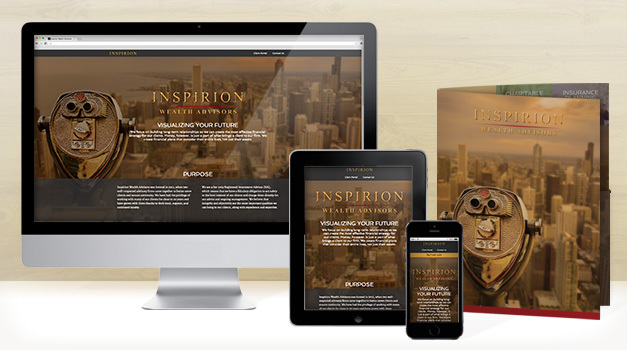 We chose the imagery, color, and messaging carefully to relate to Inspirion’s clients and to portray a tone of sophistication and professionalism. As a result of these marketing efforts, Inspirion offers a more convenient, more extensive online experience for their existing clients, while positioning itself as a trusted, loyal resource. In addition, these materials build brand awareness and more clearly communicate their dedication and their capabilities to potential clients.